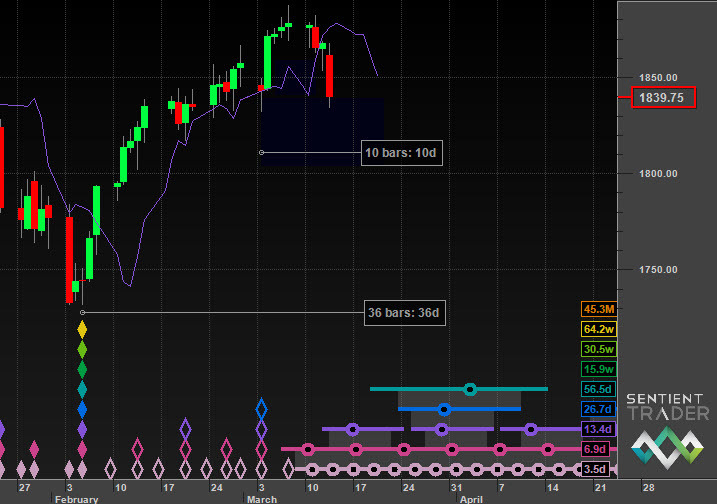 This entry was posted in Analysis US Markets on March 14, 2014 by David Hickson. Last week I discussed when we might expect a peak, and drew the conclusion that it was coming soon. It came slightly sooner than I expected as this week the US markets failed to get above last Friday’s high. Those few days have turned the current cycle shape more bearish than the symmetry I presented last week suggested, and that implies that we are in for a bearish few weeks. There are two short-term options which I would like to discuss here. To receive these blogs as soon as they are posted Join/Like/Follow Hurst Cycles. If you don’t do social media – click to have Feedburner send you these posts by email. This is the analysis I have been presenting recently which assumes that the cycles are currently running short, and has the 40-day cycle trough at the low on 3 March 2014. 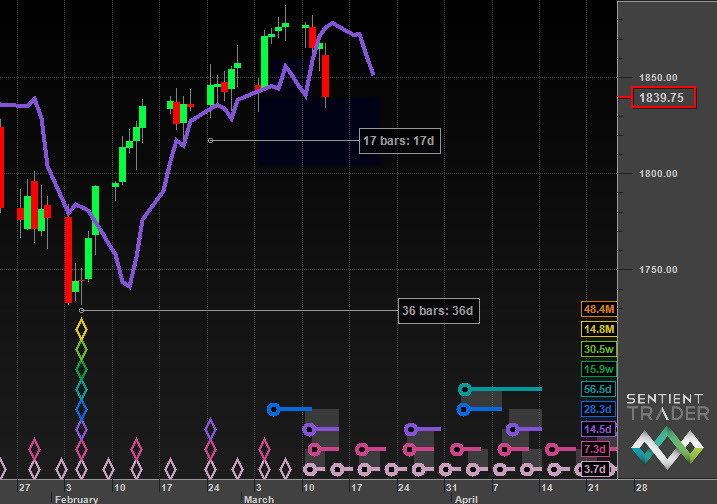 When price crossed below the 20-day FLD on Wednesday the peak was confirmed (as discussed here), and according to this analysis that was an F-category interaction between price and the FLD, implying that we are going to see a fairly strong move down (with only minor bounces) into the 80-day cycle trough expected at the beginning of April. This analysis shows that it is possible that price is now moving down into the 40-day cycle trough, after which it will bounce back up above the 20-day FLD (that purple line), and form a second peak before heading down towards the 80-day cycle trough which is expected a week later according to this analysis. Personally I prefer the first option because the analysis looks better to me, but the second option is still possible. Ironically if the second option does play out then the later peak will create a more bullish shape to the cycle, implying a faster and harder move down to balance the cycle shape, assuming of course that the symmetry within the cycle shapes persists. Why do I find this worrying? Because if the symmetry holds, the peak that we saw last Friday could well turn out to be a peak of a much longer cycle. The 20-week cycle, or even longer. And that is very bearish, implying that the market has swung into a bearish mode that could last a year or two. 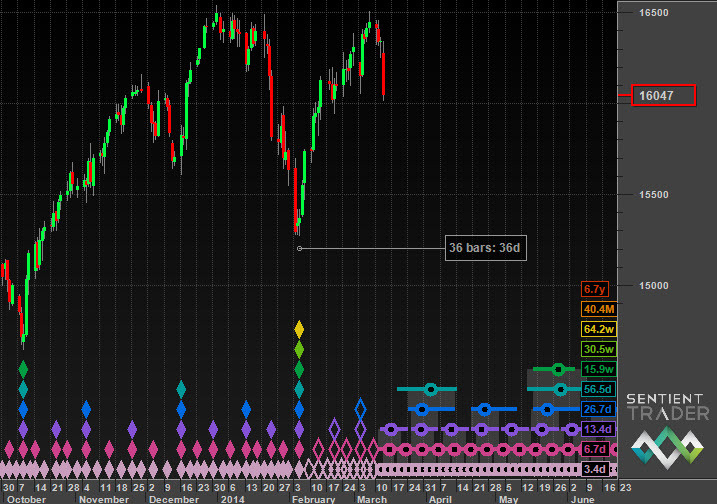 Of course at some point all symmetry in the market breaks up, but it is nevertheless cause for some concern. Have a good week and profitable trading! I’m afraid we are on the verge of a strong move down, where long cycles are involved. I think that the probability of a straddle trough is very high. I would be favoring your first scenario, in which a short 40 day cycle has passed!